The Luftmed App is available free of charge in the Apple and Android Store. After connecting the app to the respective air purifier, the display and its functions and displays are transferred to the smartphone. The device can then be controlled from anywhere. Home: On the top of the Smartphone display, the air quality and temperature are displayed as on the device on the top bar. Also, in the lower area are the power button and the speed button for adjusting the cleaning stage. Auto , Max and Sleep Mode as well as AIT can also be adjusted by means of the speed settings on the control panel. Filter level display: By pressing the filter info, the filter level of both filters is displayed on the display. Air quality indicator: Air quality display of the device is displayed by clicking on the Air Quality Index. With the remote control included in the package, the air purifier can also be effortlessly controlled from the couch. The remote control works from up to 5 meters away and with an angle of 120 degrees. P ower-Button: The power button can be used to switch the device on and off. AUTO: By clicking on Auto, the air purifier will be switched in to the intelligent Auto Mode. MAX: With the Max button, the device is placed in the purification mode with maximum power. SLEEP: The air purifier will be switched in to the Sleep Mode with the Sleep button and will run at the lowest perfomance Level. VOL + -: The volume button can be used to increase or decrease the airflow manually. There a 3 cleaning stages. AIT: Activate the air purifier by clicking on AIT in active ion mode against pollutants such as bacteria and viruses. ANION: The active ion mode against fine dust and smoke is initiated with the Anion button. Kindersicherung: Child lock is activated with the lock button. 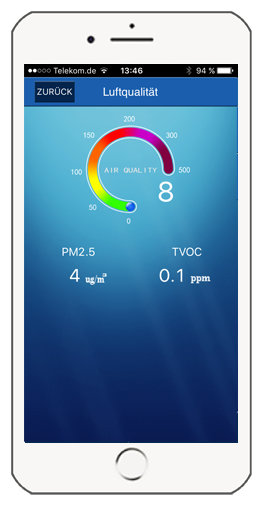 AQI: By clicking on AQI, the air quality display is switched on the display of the device. The intelligent filter level indicator from Luftmed uses a self-developed algorithm. 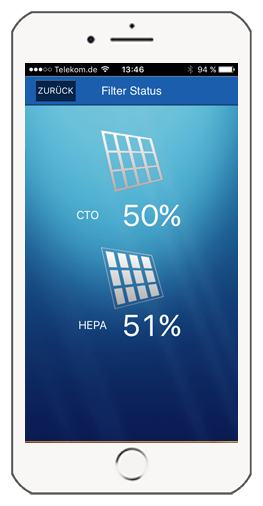 This automatically calculates the remaining lifetime of the HEPA and activated carbon filter in percentage. The service life is determined by means of the continuously measured air quality and the operating time of the air purifier. If the service life is below 10%, an exchange of the filters is indicated. Pressing the Reset button restarts the algorithm when the filters have been replaced. Can I clean the prefilter? The pre-filter does not have to be replaced and can be cleaned regularly under running water. In this case, the screen is pulled out of the buckles after opening the air cleaner flap. In addition to the running water, the dirt can be removed with a brush or a vacuum cleaner. It is important that the pre-filter is dried well after cleaning, since bacteria can otherwise form on the wet surfaces. Where can I buy new filters? New filters can be purchased on the Luftmed online shop. Only the original air-purged filter should be used. Filters from other manufacturers reduce the effect and duration of use of the respective air purifier. First, the front cover and all filters should be removed. The filters should always be reused in the following order: activated carbon filter, HEPA filter and pre-filter. The front cover should also be snapped back into place after insertion via the magnets in the housing. As a final operation, the display must be reset to the filter usage time. Both reset buttons are pressed for 3 seconds. The Auto Mode developed by Luftmed ensures an efficient and intelligent air purification of the interior air. 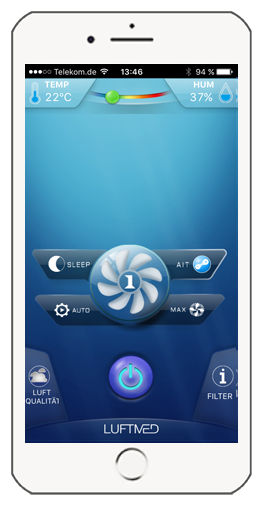 The built-in CPU chip processes the measured air quality and the device automatically switches to the most efficient cleaning stage (Sleep to Max Mode) in the Auto Mode. In Auto Mode, no functions such as AIT or sleep mode need to be operated manually. What do the colors on the AIT button mean? Why can I not change the the AIT mode in Auto Mode? In AUTO mode, the most efficient cleaning step in the interior is automatically initiated depending on the air quality measured. This function also means that the AIT module automatically adjusts itself to the given air quality and automatically decides which AIT function is better. The Sleep Mode is the lowest cleaning level of the Luftmed air purifier. It was developed for efficient air purification at night without disturbing operation. The air purifier works in Sleep Mode with a high cleaning performance with extremely quiet operation under 32 decibels. This ensures optimal sleep. Does the air purifier light up in the night? As soon as the air cleaner detects no light sources in the room and is switched to sleep mode, all luminous components of the air purifier, such as the display and the LED display, switch off automatically. Is the air purifier suitable for pollen allergy sufferers? All air-purifiers are equipped with a macromolecule HEPA filter made of polymer that filters 99% pollen from the air. The air cleaners are ideally suited for individuals allergic to pollen. What kind of pollen will be filtered out of the air? Any pollutant with a size between 0.1 and 2 micrometers can be removed from the room air by the HEPA filter System. Can I use the air purifier at night? All air-purifying air cleaners can also be used optimally at night with the built-in Sleep Mode. This makes it easier to sleep, especially for pollen allergy sufferers. Does the air purification minimize my allergy symptoms? By filtering and collecting the incoming pollen, a reduction of the allergy symptoms in the respective interior can be guaranteed. Is the air purifier suitable for house dust allergy sufferers? All air-purifiers are equipped with a pre-filter and a macromolecule HEPA filter made of polymer, which collect 99% of dust from the air and filter it. So the air purifiers are ideally suited for house dust allergy sufferers. Does the air purifier also filter mites? In addition to house dust, any internal mites with a size between 0.01 and 10 micrometers are also been removed from the room air by the HEPA filter System. Is the air purifier suitable for pet hair allergy sufferers ? Thanks to the pre-filter screen contained in the Luftmed air purifier, animal hair can be filtered effortlessly during air purification. Thus, all Luftmed products are ideally suited for animal hair allergies. Can I use the air purifier with pets? When placed on a dry, even and smooth surface, the air cleaners can also be used when pets such as dogs or cats are kept in the same room. The devices are not harmful to pets and cannot be thrown by them.